We've got some bad news and some good news in this post. The bad news is that my serger broke (RIP Brother 1034D (2014-2014)) and my sewing machine needed a tune up. I was machineless for weeks. The good news is that at least it all happened during the busy time of summer when my husband and I were traveling. Wait, who am I kidding, it still sucked, but I'm trying to look on the bright side. Let's talk about my first trip, San Francisco. A few weeks ago we headed to Alameda (a city near SF) to stay the night with our friend Matt and his girlfriend Sarah. Side note, I discovered that Sarah designs clothing patterns for a skateboarding company, so cool! 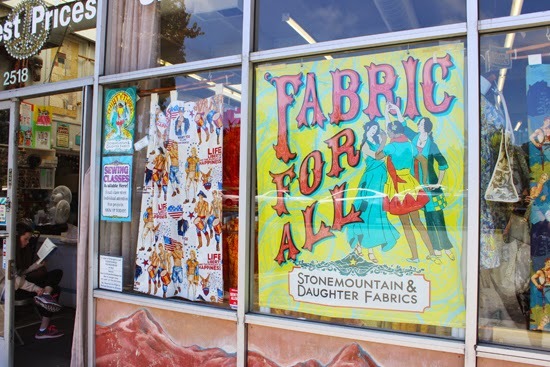 Ok back to our trip: it was a last minute idea to drive up after work (we had originally planned on leaving the next morning), so I was able to squeeze in some fabric shopping at Stonemountain and Daughter Fabrics in Berkeley. I was super excited to visit because a lot of you mentioned that I should stop in if I was nearby. 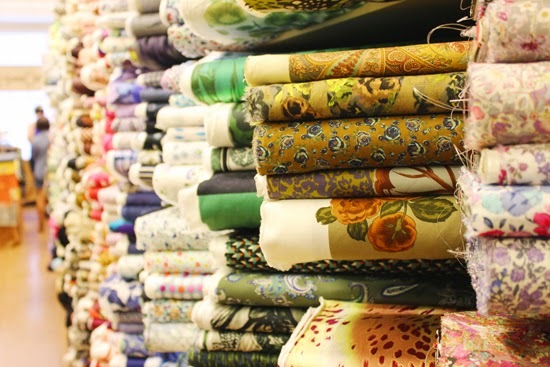 There was a large area of quilting cottons and a side room full of apparel fabrics. 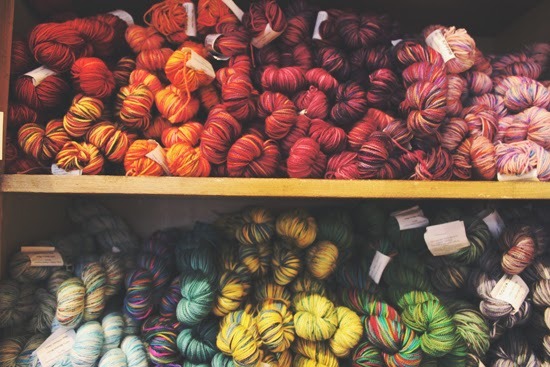 Immediately, I zoned in on the knit section and found some things that I liked and wanted to buy. Claire cut my fabric and rang me up. She was super rad and friendly and I really enjoyed talking to her. Now we are Instagram buddies, yay! Later in the day I made it to Britex in San Francisco. It's a pretty overwhelming place, they have practically everything! In the end I only bought the scuba cat fabric, but could have easily walked away with half the store if I had the funds haha. Everyone working was really nice and helpful even though it was a pretty crazy day. A water line burst in the basement of Chanel (next door) and it was chaotic in Union Square. The area was closed off to cars, other businesses were dealing with flooding issues, and there was a bunch of water running down the street. My next adventure took place in New Orleans a week or so ago. My husband and I went there for a work convention and some fun. Ever since I was a teenager reading Anne Rice books I dreamed about going to New Orleans. It did not disappoint! The history, architecture, and food (I had oysters and gumbo every single day haha) were even better than I expected. 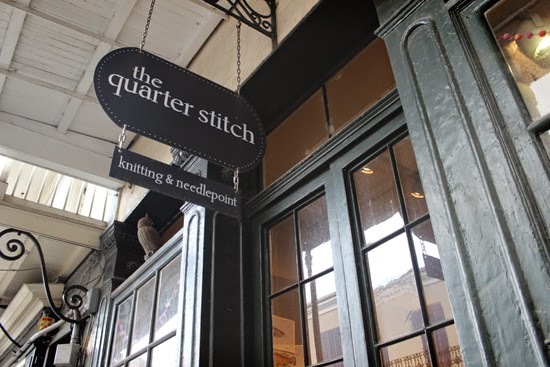 We didn't end up going to a fabric store, but I did stop in a cute yarn store in the French Quarter, The Quarter Stitch. The owner was really nice and friendly and chatted with Luke and I for a bit. 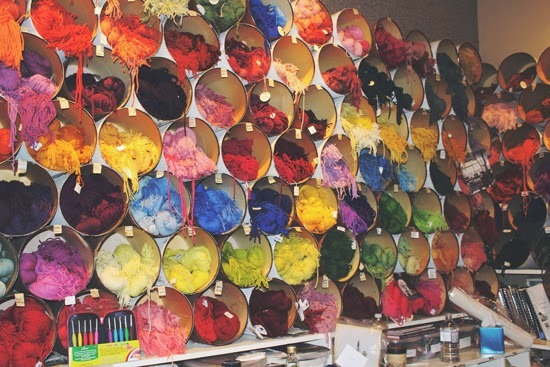 There was a huge selection of yarn and the price points were good. If I ever go back to New Orleans (hopefully I do!) I will definitely go back to this shop. My only souvenirs from the trip were some Christmas ornaments (I collect them from places we visit, dork alert), yarn from The Quarter Stitch, and this pretty hand beaded headband from Trashy Diva. I can't stop wearing this headband! Yesterday I was cruising around my yard in pajamas with it on my head and my neighbor complimented me. She probably thought I was crazy for wearing it with pink and maroon striped pants and an old worn out pink top, but whatevs. By the time I got back from my trip my sewing machine was fixed, yes! Can't wait to sew! What happened to cause your serger's untimely death? OMG!! I have a vintage bag I bought at Trashy Diva in New Orleans when I went *cough* 15 years ago. I loved all the books stores. That all had shop animals. I buy ornaments from places I've travelled to as well! My 1034D serger broke too!! I got it at Christmas and it got totally jammed in June. I brought it in for a tune-up (luckily still under warranty) and the guy at the shop didn't seem too impressed by that model. Aaaand, he failed to call me when it was fixed so I was without my serger for over 2 weeks unnecessarily...so I feel your pain. But your trips sound so fun! 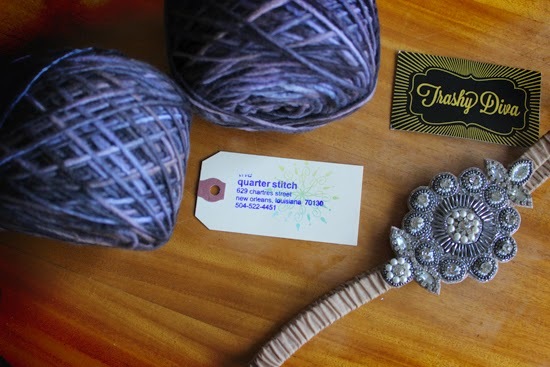 I always like getting yarn and fabric souvenirs. I just hit enter on a comment, but I'll add here too. I got the same serger fixed (timing issues) for free because I took it to a licensed repair shop that I found on the Brother website. I gave them proof of purchase (a print out receipt from Amazon) and Brother paid the shop for the repairs. Look into it if you haven't yet! Oh my goodness! Your brother serger died within a year? Oh my! It like like you had fun on your trips! I plan on going to SF next year. 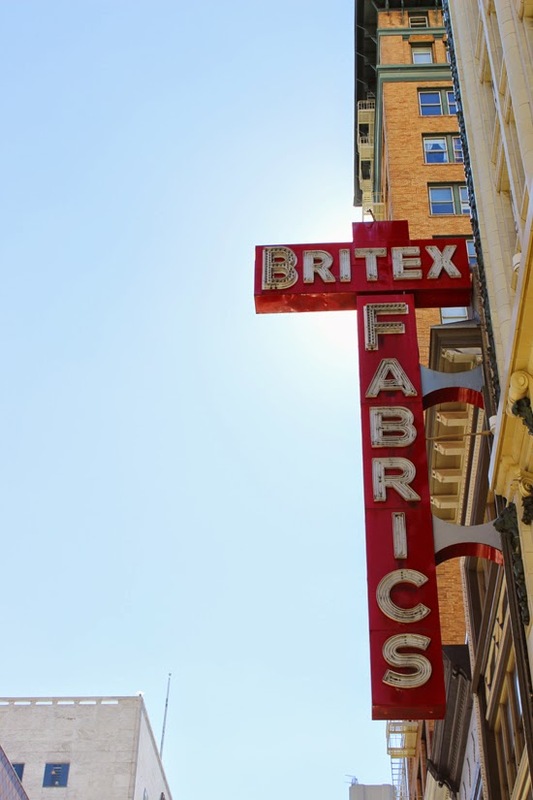 I'm hoping to go to Britex to Check out fabric, May be for my wedding dress. We are twinnies! :) I bet you got some cool ones in London, I know I did! Oh man! You are the first I have heard of having that problem (besides myself, of course). Everyone I know has had really good luck with their machines. Well, I am glad that you got yours fixed! Cool!!!! Where are you visiting from?? That's cool that they did that! I ended up trading my broken serger in for a new machine. They gave me a credit that was wayyy more than what I paid for originally. Plus I got a machine that is easier to thread, so I am stoked on that. Oh, sounds like you found an even better solution! I didn't know what I was doing when I picked the 1034D except that it was popular and pretty inexpensive. One day I'd like to upgrade to something a little sturdier with more bells and whistles. 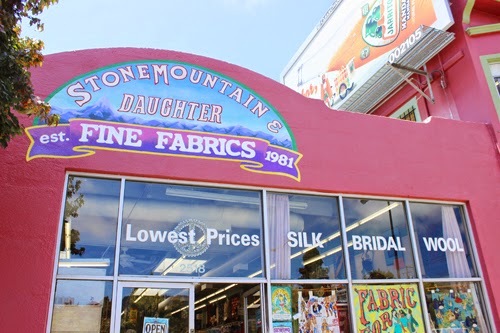 You were at my favorite fabric stores and in two of my favorite cities! How could I not like this post? I'm sorry to hear about the death of your serger. I had the same model and it died last year and was replaced with a janome which I love. I did! I love all my London ornaments. Well, I love them all. They are all a part of me in a way. As corny as that sounds. I love Britex, but yeah totally overwhelming! I'm sad as someone recommended Stone Mountain to me on a recent visit to the area but I just didn't have time. It looks cool!